The role of caregiver can come about expectedly or thrust upon someone suddenly. It is a role that is guided by the heart and done out of love, with the patient's best interests at heart. Caregivers can get overlooked with all of the tasks that must be completed, as the patient's concerns remain a top priority. 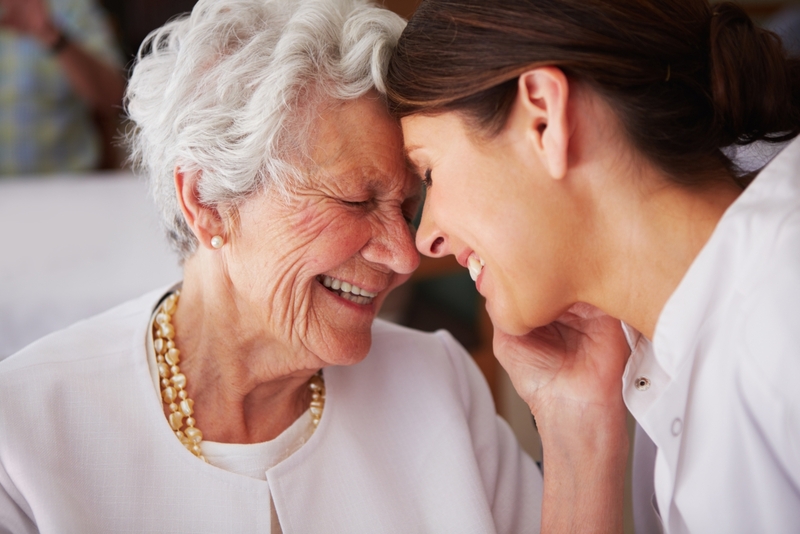 It is important to show caregivers that they are appreciated for their patience and compassion within their new role. We'd like to use this month to acknowledge those who have offered themselves selflessly to their loved ones in hopes of providing comfort and support. Below are notes of appreciation that patients submitted during Caregiver Awareness Month. To find a name, click on the letter grouping that the first name would fall under. Thank you to all the staff at mt Sinai medical cancer center for smiles that help you feel better. If not for you where I would be. I am immensely thankful. Words alone can never truly express my sincere and heartfelt thanks to everyone who has been in my life to give me encouragement throughout my illness. I've been so blessed! It's encouraging to know that I definitely have a community of care/supports that has embraced me in my journey. I cannot thank you enough for the coverage you have given me to support my cancer expenses. There is no way I could handle much of that myself ever. Thanks also to my clinic that handles most all of this for me. It is the Hemotology Clinic in Salem. Oregon. Hope you all had a happy Thanksgiving. I would like to thank my family, friends, doctors, and nurses at Emory in Atlanta for their help and care for me. Thank you for giving all of yourself so selflessly to make sure my grandpa (your dad), felt safe and loved during the last months of his life. He loved you so much and called for you until his death. You are a gem! Thank you Abu for knowing exactly what we needed at every moment: for the "half-hot" water with lemon, the shoulder to cry on, the special essential oils, the nutritious lunches packed with care for the hospital, the leg massages, the pep talks, tracking the med schedule, doing "the bagel", the crazy kitchen dances, living room bowling and impromptu yoga. You are incredible and I love you to the moon and back! Ali S. My best friend Ali is a wonderful caregiver! Ali, is my sister from another mister, and takes very good care of her Dad who is battling leukemia & lymphoma. I love her so much and she deserves a shout out! Happy Caregiver Awareness Boo! Thank you my strong Tiger for taking such good care of me over the last year and through the stem-cell transplant. You are my rock! My husband has been my wonderful caregiver for the past 1-1/2 years since my diagnosis of multiple myeloma . I want to thank him for all the support he has given me. Thank you so much for helping with my care, for being so strong and caring from a young age. My daughter, you have taught me more than you will ever know. I love you so much! Thank you for pushing me to exercise and eat when it was the last thing I wanted to do. I wouldn't be here without your support! It was devastating news but one person rose to the challenge that lay ahead. She searched tirelessly for the best medical professionals available, arranged and coordinated appointments, maintained accurate and comprehensive records ,provided constant care and emotional support, all while simultaneously caring for her own family. We will always remember and be forever grateful to Allison, daughter in law, wife, mother and caregiver, for the love and support you provided Mike. Thanks for being that “extra special “ someone. He stays with me as much as he can in chemo, drives me to Portland, which is about 84 miles away, and back. Without his help, I don't know what I'd do. This is my husband. Thank you, Dear. There was not a day we didn’t feel like the center of his universe. He made sure we had all his love and care! Thank you for always being there for me, you have been there from the very start of this journey and I'll never forget that! Amanda F. & Deanna R.
I am so thankful that they were each there for me during both my stem cell transplants. Thank you from the depths of my heart for the selfless gift of love you continually give to mom. May God bless you richly! Mom, your compassion towards our grandmother taught me strength. Thank you for faithfully teaching Rae, dad and me that true love is action. Love you! She is a fierce force of nature doing everything she can to take care of Rob.. She does it selflessly and doesn't’t think about how it could impact her. rob is in well skilled and safe hands with Anita as a caregiver. Anne is always giving & caregiving. She reaches out to her family & friends when she knows they need support, usually with surprise gifts or unannounced gourmet meals from her kitchen. I am in awe of her strength & willingness to give so generously of herself. Thank you for being the absolute best caregiver I could ever dream of having. You are my angel, sent from Heaven. Thank you for loving and taking such good care of me. For loving and going the journey of AML with our daughter LaTashia. Arthur has medical problems of his own, but he volunteers to take me to doctor visits, keeps track of appointments, does grocery shopping, and listens to me when I am feeling down. I do not know what I would do without him. Her love and dedication has not only saved my life but has made it a joy to be alive and able to share time with her. How blessed I am to have such a wonderful person in my life. She was "my rock" back in 2012 when I was diagnosed with ALL. She went with me to Tampa for three months while I received my stem cell transplant and took care of me like no one else would have. Their support for myself and their sister during her treatment period was truly inspirational and I couldn't have done it all without them. Barry thank you for caring for your mom and father the way that you do. I see how you take the job seriously and my prayers are with you. He's not only my caretaker he's the man I love. Does not hesitate to care for me even when at my worst. Unconditional Love at its finest! Bernd has selflessly taken care of his wonderful wife Darlene. You are an example of what a person does in a time of need and you are admired and appreciated for all that you do for Darlene. Mom, you are superwoman. I admire your selflessness, compassion, and positive attitude, especially through dad’s fight. I am thankful for you every day. I love you! She is a very special person who took great care of me during my battle and my recovery. Bill B is a wonderful caregiver, friend and husband. He shares my progress with friends and family even though he has done this before with with his before with his first wife. He shares his strength and kindness, I love him very much. A kind considerate caregiver. He no longer works so that he can take care of me. He certainly does his best to make sure I get to anywhere I could go, and he does it all with love. He thinks nothing of it. Thank you Bobby. My father; he took me to every single appt and chemo treatment. He kept me laughing and kept me company, even when I was sleeping in the tx chair. I would like to honor Brad at Cleveland Clinic. He is kind, compassionate, and has a great smile and attitude every time he meets you. He also has the best socks! Thank you, Dr. Pohlman! My best friend. Words cannot express how much she supported and helped me through the cancer journey. Thank you being my caregiver twice, ten years apart. You were my inspiration all the way! Candyce H. For the loving care of her 99 year old mother, Catherine. Takes a strong and patient woman! Thank you for all that you do for Mom! I know it's not easy adjusting to this role, however, you've done an amazing job! I'd like to honor my sister. She is always supportive of me and in between her busy life working in the Medical Field and taking care of her Children she still find time to be the team Captain of my Light The Night Group Cece's Angel's of Faith. She is a natural giver and always here to make sure I'm okay. I love her and Thank her for being the person she is. I would like to honor my dad. He has never missed a beat. He kept my spirits up and never doubted that I could beat this. He’s not only my caregiver, he’s my hero. She has been a caregiver at Brookdale in Bay City, MI for 20 years, and has loved ever minute of it. Cheryl G. She is my sister and I could not make it through this journey without her. She has been there for me with amazing support and encouragement. Thanks does not begin to cover it! Thank you for being a caring, compassionate and relentless caregiver. You drop everything for family selflessly providing support to all of us. We Love you!! Christine has also taken on the role of full time care giver for her Mother. She has done it all with great love and grace. She is my hero. Cindy thank you for caring for and supporting me during my battle, it meant so much to me. Now it is my turn to care for and support you in your double battle. My wife stood at my side every step of the way and gave me strength and purpose. I would love to submit Cindy S. name as an excellent caregiver. She is totally putting my care first & above her own needs. Mom to fighter Luke. Caregivers give up their life to care for their children. I went on disability for 1 year and since then it was all about lukes care . I wouldn’t change a thing, my children are my world. Today I want to say good job me . You are amazing. You have been an absolute rock and because of you I have beat NHL twice. You are an amazing wife, mother and best friend anyone could have asked for. My wife, who has cared for a married couple for the past 8 years. My wife initially volunteered to care for my mother,( Lola ) who lost her battle with non-Hodgkin’s on January 8th 2009. I miss her dearly. My wife was diagnosed with leukemia on July 17th 2017 and she continues to care for our dear friends, the elderly couple. The man/ husband passed way this October 2017. My wife is in my biased opinion, is a kindred spirit and the love of my life. I refuse to consider life without her, that is simply not an option. She deserves all the recognition in the world and all the love in my heart and that of our children & grandchildren. I love you Cynthia. You were my rock and my strength. I could not ask for a better partner in life. You are my rock. Thank you for waiting during surgeries, scans, and treatments, going with me to every appointment, and being my personal chef! Dave was the best caregiver ever! He stuck by me during 2 bouts with Hodgkins Lymphoma and thru stem cell transplant. Many thanks- I couldn't do this without you! Babe, thanks for being my wife and caregiver through these tough times. I love you. Thank you for being there for mom during her illness. I know she is happy and thankful that you were there for her during her hospitalizations and her return home. Love you! Since our son was diagnosed with leukemia in December of 2015 she has been remarkable. I can't thank her enough and especially Justyn thank her enough for EVERYTHING she does. I couldn't do this journey without you! I extremely appreciate Desirae P. for always keeping up with reminding me to get my important blood work and the results. Double checking the calendar for important dates and all of her knowledge. Most importantly for understanding the struggles when I am having bad side effects. I want to honor my mother. She was always there for me at all times and continues to be there today. Love you! Thanks for helping Adriana through a lot and sacrificing your time. She trusted you. You did it for HER. You Are a Warrior! Thank you mom for being there for me since day one of my diagnosis! Without you I wouldn't be where I am at today and I wouldn't be as strong as I am without you! I could not have done all I have done nor gotten this far without you standing beside me. Thank you for all you do for me. Your continuous, genuine care, love and support is amazing and priceless. I'm blessed because I have each of you in my life. I can't thank you enough. Much love. DR (my wife) for caring for me over the past 14 years while I’ve battled NHL. She has always been there to buoy me up and assist me through the physically and mentally challenging times. I love you sweetheart! Thank you: Elaine for the 37 years you have been my caregiver, you have been strong, compassionate, and loving when these challenges have come. My sister-in-law has cared for my brother tirelessly these past 4 years with his Lymphoma battle. My sister's and I thank you from the bottom of our hearts for your loving care. Mom, I couldn’t have asked for a more loving, sacrificing, patient, compassionate, and strong caregiver. Thank you for being supermom. You are an amazing wife, mom, and friend! You are a rock star, with many talents to keep your family moving while supporting Dan and getting it done! We love and support you, and will always have your back! We were married just a first yr when I was diagnosed.It's been 19 yrs post transplant. He's still my best friend and biggest cheerleader. Erica, I very much appreciate your patience and compassion when you helped dad and grandpa through their final journey on earth. Your love and support is not forgotten. Eve ministers to many people, she is a lovely person!! Thank you for helping our family through each day. Love you! Mom, thank you for being one of the strongest people I know! We wouldn't be anywhere without you. Gail has been there every step of the way. Her impeccable note keeping helps us review everyday. Thank you very much for the daily visits to mom during her hospitalizations and also when she is home. She looks forward to your visits and I appreciate all the help you have provided her. For working a tough full-time job but still finding the time and energy to be my only caregiver. My sister-in-law who has been my primary caregiver (aka MY Angel) since my first diagnosis of NHL. She continues to help me to this day. To My Rock, My Everything, My Wife, You stood by me every step of the way. I Love with all my Heart. I can’t thank you enough, Greg, my husband, my friend, my protector. Your caring and support mean everything to me, especially when I feel defeated. You are the best and I love you. Thank you for supporting our girl through her tough fight and for dealing with the craziness so gracefully! Thank you for taking such tremendous, loving care of your daughter / my wife / your grandkids’ mom during her time of need. Your love and support was amazing. Thank you for taking such good care of me and baby Georgia during chemo. I love you more than you will ever know. My wonderful husband James. Thank you, you were by my side, gave me strength to continue with my fight. I want to THANK YOU for all you have done for me. You are truly my special angel and my best friend. Dad, we are so blessed by your care of mother. You always show her gentleness and patience, kindness and grace, love and commitment. Your love and commitment to helping me survive this sickness is inspiring and courageous. I love you. Jeff, there are not enough words in the word to fully explain how much I love you. You were my rock during the highs and lows of treatment. I love you, forever and always. A caregiver as a nurse who selflessly serves daily whether at home with a sick, growing, beautiful baby or at work with our beloved bone marrow patients-- you're also a hero! This debilitating illness. The sleepless nights. The anxiety, the worry, the pain, the fear: all soothed by your endless love. I wish it were different, but all we can do is carry the weight of it and believe that we will win. And that weight is lighter, and the belief stronger, because of you. Thank you, sweetie, I love you forever. I want to thank you for all you have done as my caregiver throughout this journey. Without you it would have been a tough road. Love you!!! I would not be here without your efforts! Thank you! Love Eric. My sister; she kept my spirits up when I was feeling my worst and attended classes at the support center with me to keep me company. She pulled through as my Mama Bear on multiple occasions. You are my world. We've been through so much together and you are always there right by my side. Love and thank you with all my heart forever. For 10 years my husband has helped me deal with AML and transplant without complaint. Even with drastic changes to our life, he still helps. It’s love. Thank you very much for being such a wonderful sister in law to my mother during her illness. You have been so wonderful and helpful to both my parents and we love and appreciate you very much! A wonderful caregiver for her husband. Over a year's worth of devotion and commitment thus far in helping him through his cancer journey. She is a blessing! A sincere thanks to my wife Julie. Without her living with cancer might very well have been unbearable! You are the rock in our family. You showed us Courage, Comfort, and Compassion which carried all of us. We love you!! It wasn't until I got lymphoma that I truly knew there is a God because He sent an angel to take care of me. Mom, THANK YOU for your constant companionship during my MDS then progression to AML diagnosis, treatments, stem cell transplant and continued care. I love you! Kate, thank you for taking the lead on mom's care every day. We are so grateful. These ladies are my Mom & my Wife. Both have been thru thick & thin in regards to my health. Both have sacrificed there their time, energy & often their work schedules. These ladies rock in my book! Thank you for acknowledging my taking care of our son with his battle against Leukemia. There is no where else I'd rather be than taking care of and loving our son. You have been one of my and Justyn's main support systems. We couldn't have made it through some of these days without you by our side. Thank you, also. Thank you for being there for me 24/7 while I battled AML. I’m sorry you died a year later from pancreatic cancer. It was my honor to be your caregiver and I will always cherish our 7 years together. Until we meet again, my love. I don't know if I would have made it without him. He's such a very important person in my life. I love him more and more every day for standing right there with me! Kevin He had no idea when he said these wedding vows, "in sickness and in health" what our future would hold. I offer these humble words of thanksgiving and gratitude to him. Thank you for your continued example of compassion, strength and selfless love. YOU MAKE ME STRONG!! I am truly blessed being apart of your life. Love you! Thank you for your loving care and self sacrifices as you help me in my fight against cancer. Love you! Kim L., Tyler B., & Deb B. Thanks to these adult children who gave beyond all expectations. When my major back surgery kept me from care-caring, you did! For loving her sister LaTashia and having the energy to travel to and from the hospital. My husband has been the greatest care taker I could have ever ask for. I have been truly blessed to have him in my life for the last 40 years. Thanks. Thanks to my best friend, lover and extraordinary wife. Standing by me through everything that has come my way. Thanks for the support. Love you. Thank you for your compassion and love throughout my treatment. Your selflessness and patience helped me each and every day. You truly are amazing! At last, there is a month to celebrate you, Caregiver Awareness Month! Thank you for providing such loving care of mom. During her illness you have had to learn to cook, do laundry, grocery shop, pay the bills as well as take care of mom. I am so proud of you! I would like to thank Lela for being there for me during my year of battle. She was there for me during good time and was there for the days that I was very sick. Thank You Lela. You have been my wonderful partner, wife and best friend for the last forty one years. Your compassionate, sacrificial and loving care has been beyond wonderful. Mom-You have taken such loving care of Dad as he battles this disease. We’re so lucky to have you. Love you! Linda gave selflessly to care for my physical, emotional and spiritual needs for the past 10 years. She always put my care in front of her own. She is my wife, friend and hero. Linda is my wife of 55 years. She has been there through all my issues and problems. When diagnosed with Lymphoma, her response was, WE can beat this to. No matter what was needed, she was at my side to through all phases of treatment. My mom. Kind, optimistic, loving, resourceful, smart, patient, generous and it's with that amazing grace that she cares for my sweet, loving dad with leukemia. She is a gift to my dad, my brother and I and the world. Love you, mom. Linda, caregiver for Mr. Wilson, a family friend as well as at Communicare rehab and at Holy Temple Church of Christ. You have done so much to help your husband continue living a normal life. It is difficult and you do it while rarely complaining. If it is too much, you must always make time to care for you! I will like to acknowledge Lisa to let her know how much I appreciate her help and devotion and love for helping me in this time of need. My wife has given her time and sacrifice. She never complained for free. God bless her and us all. Liz been an awesome educator, organizer, and loving support to my sister and to all of us who journey with Kathy during this roller coaster ride of hers! Liz - you are a caregiver in your unique way! Thanks to you, Liz. My cousin rocks in her spirit giving nature! She has provided valuable awareness! She always finds the silver lining in countless trips to Sloan in NYC. I am forever grateful that she is able to take the time to be at every appointment to hold my hand, wipe a tear or ask the doctor a question. The "family caregiver" - always there when someone needs help. Never has to be asked but always shows up. The strength you have shown caring for Tom and Christine amazes me. We could not get through this without you! I love you! The only thing larger than the feasts she creates is her heart and her love for everybody she meets. She is always there for everyone else. After dealing with a medical issue of her own, has spent the last 6 years being there and supporting her daughter through battles with Breast cancer. As well now her husband who also is battling cancer. While surrounded by difficult situations she continues to be strong and be there for everyone else first! Thank you for being my twin, stem cell donor, hero, and perfect match. My cousin Lynn is a caregiver to her husband who has MS, as well as caring for her elderly mother. She is my hero! Dad – thank you for all you are doing for mom at this time! Your dedication to serving mom is inspiring and so sweet. Love you! Thanks for working to take care of me! My stem cell transplant was a miracle. You are a great wife, a great friend, a great person. God sent you by my side so I can see him in your eyes, care, among other things. Thank you, Maria, for always being my advocate when I was sick. I won’t ever be able to repay your efforts, but I’ll spend my life trying. I love you!! I appreciate your patience, kindness and willingness to serve. Your compassion is recognized by those around you. God bless you as you bless others. She is the best. Never complains and is a joy to be around. Makes my parents very happy. My wife has been the ROCK I have leaned on for 27 years and counting. She has tirelessly, faithfully, given loving, supporting, spiritual, earthly personal daily care to her mother, Joyce, for years preceding her recent death. My dearest friend Mary Lou whom makes life a happier, joyful place to be. Thank you for loving me through cancer. You carried me when I could not carry myself. Thank you for always believing in me, and waiting patiently for me to heal. Thank you for giving so much of yourself. I love you! Thank you for taking such good care of your mom and my aunt. You are definitely super woman. I would like to honor my daughter who was there for me and still is from the phone call that I received to all of my doctor appointments. Not a day goes by that I cannot say “thank you” to her. A resounding debt of gratitude to my husband, Michael who never left my side no matter how tough things got. You cared for me, kept the Doctors and nurses in check and fought with and for me. I probably would not be writing this now if not for you. I love you my guardian angel here on earth. At a time when most teenagers are mapping out their college careers, my son was busy driving me to support groups and preparing meals. I just want him and others to know how grateful I am for his support both then and now. Brought his home cooked meals to me during chemo when I couldn't tolerate hospital food. Wouldn't have gotten through chemo without him. Dad, your tenderness, compassion, and unwavering support is inspiring. Thank you for all that you are doing each and every day for mom. For love and care of her father Anthony Greco who is being treated for multiple myeloma. I’m sorry to have to have you as my primary caregiver, but eternally grateful for your love and support. Your strength and love get me through each day with a smile! Thank you for being an unwavering support for ALL of us! I look fondly on our days as a two person team when Mom was at the hospital <3 I appreciate you so much! Mike has always been there through the good & the bad. He even learned how to cook so that I could recover. Parker, you have been with me every step of the way throughout my cancer journey. You even sat with me when I was radioactive after being injected with the radioactive serum for my PET/CT scan (I won’t let you do that again!) I love you. Thank you for taking such good care of Sarah. And for your many sacrifices. Thanks for being at appointments, translating medical talk, gentle opinions, preparing meals, helping with hygiene & being a friend who’s more devoted than a sister. Pamela C. I would like to thank my wife ,for all her love. My wife Pam has given me the Love of Jesus and of a wife more than any person can give. Thank you so much. I love you. My Parents have been wonderful. I am in remission for five years. They have done so many things for me and my family. Thank you! Mom, Your unwavering strength, unending love, and unshakable faith has shown us what true love looks like. Thank you for loving our daddy/pops so well. You've been there every step of my journey. Thank you for being my sister, friend, and a special care/supporter. With loving gratitude for all you do for me, my sister. You are so nurturing, so caring. We (family) owe you so much for trying to be sure we are okay. After my myeloma diagnosis, Mama needed your talents most for her stroke rehab. You seamlessly started to organize us to care for her. So much love for you. For loving and being the best son to LaTashia during her journey. 7 years she’s shown unconditional love. I wish I could do more for my wife. She’s given so much. Thank you isn't enough. I would like to HONOR THE BEST CAREGIVER IN THE WORLD, my wife Rebecca. She is THE most AMAZING caregiver ever and LOVE HER SO MUCH for ALL she does. For all the sleepless nights, doctor appointments, love & care you gave Kevin while he was here. Thank you. Your the best mother anyone could ask for. I know he felt the exact same way. My sister for her positivity and devotion to me during and after treatment. My husband has been my rock every day. I honor my Dad, my brothers, my in-laws, my daughter and her family for all the love and support. I honor our friends and neighbors for their daily support. I love you all more than words can ever say. Thank you for all of the love and support you gave me and our family as you tirelessly took care of me and the boys. Coming up to visit even when you didn’t feel like it. Making sure that the boys got to all of their needs meet. Love you so much! Thank you sweetheart for all of the love, patience and care you showered me with as we walked through the world of cancer and everything else that was going on during that time. Love you so much! When you took over the title of "WIFE" you never thought it would include being "Caregiver". I cannot make it without your love, support and help during these last 5 years. Thank you and Love you. Your unconditional love and support made all the difference during my battle with APL and recovery. You were with me every step of the way and your encouragement kept me on track and focused on the priorities. Thank you! My sister Rose for taking such good care of our Mom. Rose took mom to all of her treatments and continues to take her to follow up appointments. I just want her to know how much I appreciate her! I learn from you the meaning of what St. Paul taught us Faith expressing itself through Love. You are in my heart forever. The selfless caregiver who was always there with compassionate words, deeds, hugs. Thank you Roy, love of my life. Mom, we were blessed with Pete’s additional time on earth because of your selflessness. I’ll always be grateful for how cared for him. She stood by my son through his fight with cancer. Now they have a daughter together. THANK YOU!!!!! Samantha N. Thank you to my beautiful wife, Samantha, for faithfully serving as my caregiver through AML. She was a rock amid a sea of uncertainty. Mom, I want to thank you for being by my side for the last 4 years through everything I've been through. I wouldn't be alive today if it weren't for you. You are the best caretaker/donor! I love you. Thank you for being such a wonderful sister-in-law to my mom. You have spent countless hours taking care of my parents and I want you to know how much we appreciate and love you! Thank you to my caregivers for your compassionate care over the last 5-1/2 years. I will be forever grateful for the quality of life you have given me. For his unrelenting care and dedication to my daughter Marissa in her fight against Leukemia. I would like to thank my beautiful wife for taking care of since day one. She stuck with me through it all the good days and the very bad one I couldn't have don it without her she's not a doctor but she saved my life she's my bedside doctor my wife I love you with all my heart words can't began to explain how grateful I am for having you in my life. My husband, thank you for being there every step of the way in my fight. You are my greatest strength and I couldn't do this without you. My mother and my rock. She stood by me throughout my entire treatment. She was especially incredible during my hospital stay. I am writing to recognize my wife, Tia. She is the best caregiver I could have ever asked for. For months at a time over the last eight plus years, she has taken care of me without a single complaint. I love you, T! Thank you for taking amazing care of both me and our three month old baby after I was diagnosed with HL. Love you! Thank you for stepping up and taking care of me and the family during this trying time love you always. Mom, you've been a hero to me since my diagnosis. You had no idea what was to come when we went to the doctor, but you never hesitated to stay by me and make sure I got well again. I love you. I’ll never be able to repay you for your endless support. Thank you, Big Sister! I don’t know what I would do without your constant love and care for me. You are the best. I love you so much. Thank you for the laughter, leaning, listening, learning and love. You’re my hero. Many thanks for your constant and undying support through our struggle with fighting this disease! I love you! She has been my rock and confidant while I have been battling non-Hodgkin lymphoma and chronic lymphocytic leukemia. She is just an angel and is always by my side to encourage me to not give up.Valerie always keeps a smile on her face and never shows that she is worried.I cannot imagine going through this without her by my side. Val your compassion towards others is like no other. Thank you for all you do and all that you are. Thank you for your selflessness and patience you exhume everyday. You truly are awesome!!! I was diagnosed 10 1/2 years ago CML Leukemia. My wife cooks wonderful healthy meals. She encourages me to keep playing my guitar and write songs . I thank God for her everyday. Veronica, you are leading this journey for your son with strength, perseverance and an incredibly positive and grateful attitude. You are an inspiration. I hope you feel loved and supported. Troy is so lucky to have your for a Mom, cheerleader and nurse! Stay strong Veronica! She gives 110% to make sure she gives the best care possible. She is selfless and loving and a blessing to the person she cares for, and all his family/friends. Dad – you are a pillar of strength and was always there for Mom through everything no matter what. Your love for her was…and is…. limitless. I Thank my husband for taking care of me through my AML Leukemia journey since '08. Now to get through the GvHD stuff. For taking care of our best friend John during his most recent medical treatment. Wendy T. Mama, thank you for taking good care of Daddy! We all know how hard it was on you. You are my hero! I love you! I would like to honor Will , my strong,caring husband. My mom, Natalie, my mother-in-law, Gerri and my sister-in-law Johanna and brother-in-law Ben for being there and changing their lives around to help me battle this disease. Bill it's hard to find words for your compassion and love as delayed neurotoxicity is part of my (our) life. I honor you during this Caregiver Awareness Month! My awesome wife made sure I got the best treatment possible at home as well as at DUMC. She became my personal nurse. Thank you for being with me through it all. You are my forever. My sister stayed with me every single moment in the hospital for over a month and even though chemo was horrible having her by my side was the best memories I have. For caregiver resources, please click here. Is this your first time visiting our site? Contact an Information Specialist to learn about our resources available to patients and caregivers.